Driving from Sarasota to Tampa this weekend, I realized that although I’ve described my preferred away-from-home car safety set-up for Chloe (a 3-in-1 vest harness plus the strap from a PetBuckle kit), I’ve never given you a picture of it in action. So here’s a picture of Chloe in my father-in-law’s van, just after a very satisfying trip to one of her favorite dog parks. It’s already hot in Florida, so she’s resting on the Zentek pad I bought a while ago. Please note that the strap is long enough to let her lie down comfortably, but short enough to keep her from being slung around the car in an emergency. The only downside of this set-up is that she can’t quite see out of the window, which she loves to do (at home, our car is equipped with a booster seat). The tidiest collapsible booster seat I’ve found, though, only works on seats you can pass a belly-band around, and you can’t always be sure that the rental car you’re getting will have free-standing back seats. It also takes up more room than I currently have in Chloe’s suitcase, so we settle for the very compact harness-and-strap option. Such a great reminder to do this and to post this. No matter what kind of harness/belt system you use in your car, the important thing is to use something. When your car is going 60 mph, so is your pet. 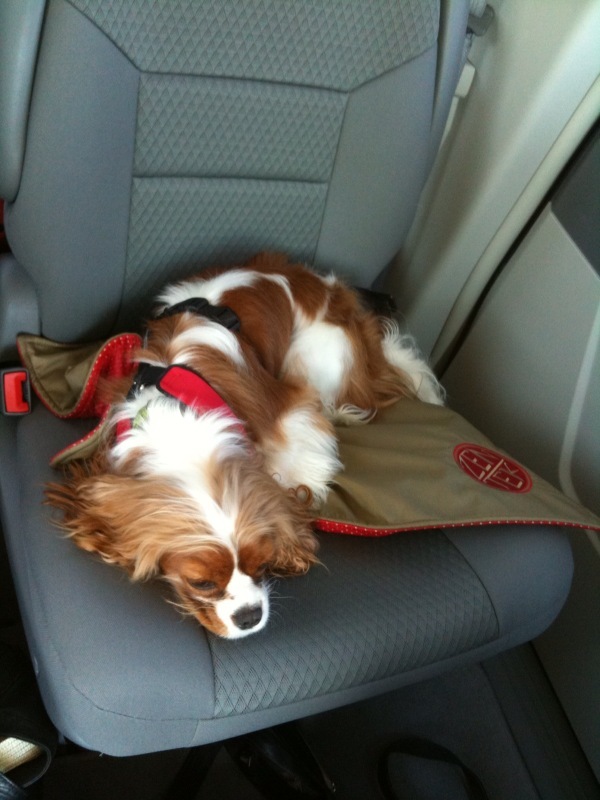 Unbelted pets are unlikely to survive an emergency stop, much less a crash. Chloe is a very lucky girl to have such a vigilant product tester for a guardian! The pictured combination looks extremely safe — and comfy.